My heart wants to say something to you. 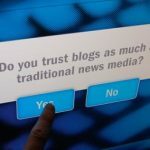 If you are interested in journalism, than blogging is not anything hostile, but its a grand way to sharpen your reporting and journalistic skills. Blogs are not something that would perhaps happen to journalism in future. They are something which have already been happened to the journalism. They are not the future of journalism, they are the present. Bloggers live in explosion of information, and they try to enclose a sea in a bowl. They are exposed to a storm of information, and they have got to be on their toes to keep their content interesting, conflicting, prickly, and useful, while keeping it readable and digestible. Its imperative that traditional journalist should join the blogorama.